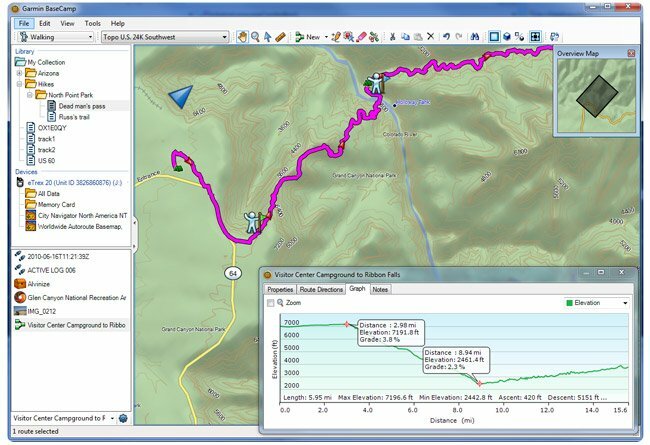 The Garmin BaseCamp application was developed to be a powerful tool that provides an interface for viewing Garmin map products and managing geographic data. The basic map contains major cities, roads, and highways. Other map products contain additional information, such as streets, addresses, points of interest, or topographical information. Map data only appears if a map product is installed, unlocked, and selected. You can download or import additional map information, called "overlays," which can be displayed on the map. You can save overlays on your computer or on a compatible Garmin device. You can work with overlays in the same manner as other data, including transferring overlays to and from compatible Garmin devices and organizing overlays using lists. A waypoint is a favorite location that you mark on the map. It can be an address, an existing map feature, a point of interest, or any other point on the map. You can use waypoints to mark places like your home, a camp site, or a favorite scenic point. BaseCamp can calculate routes between two or more waypoints. BaseCamp shows routes as colored lines on the map. You can create routes in BaseCamp or transfer them from a Garmin GPS device. A filtered route follows a path that you draw on the map. When calculating a filtered route, BaseCamp automatically generates waypoints that are not saved in the Library and Devices area. You can use the route options to change the number of waypoints in a filtered route. A track consists of a series of connected points that contain position and elevation information. You can transfer tracks created on your Garmin GPS device into BaseCamp. Tracks can be viewed on the map. You can also create and edit tracks on the map. BaseCamp stores saved waypoints, routes, and tracks in the Library and Devices area. The Library and Devices area appears on the left side of the BaseCamp window. The Library and Devices area consists of two panes. The upper pane displays lists and connected devices. The lower pane displays the contents of the selected list or device. · Transfer data to and from your GPS device. · Create, view, and edit waypoints, routes, and tracks. · Organize saved waypoints, routes, tracks, and geocaches in the Library and Devices area. · Find items, addresses, and Points of Interest (POIs) included in your detailed map data. · View map data in 2D and 3D. · View topographical information included in your detailed map data. · Geotag photos with geographical location information. · Print detailed topographical maps, Public Land Survey (PLS) quads, and multi-page poster maps. · Download and view BirdsEye satellite imagery. · Import and view Garmin Custom Maps. Top 4 Download periodically updates software information of Garmin BaseCamp 4.7.0 full version from the publisher, but some information may be slightly out-of-date. Using warez version, crack, warez passwords, patches, serial numbers, registration codes, key generator, pirate key, keymaker or keygen for Garmin BaseCamp 4.7.0 license key is illegal and prevent future development of Garmin BaseCamp 4.7.0. Download links are directly from our mirrors or publisher's website, Garmin BaseCamp 4.7.0 torrent files or shared files from free file sharing and free upload services, including Rapidshare, HellShare, HotFile, FileServe, MegaUpload, YouSendIt, SendSpace, DepositFiles, Letitbit, MailBigFile, DropSend, MediaMax, LeapFile, zUpload, MyOtherDrive, DivShare or MediaFire, are not allowed! Your computer will be at risk getting infected with spyware, adware, viruses, worms, trojan horses, dialers, etc while you are searching and browsing these illegal sites which distribute a so called keygen, key generator, pirate key, serial number, warez full version or crack for Garmin BaseCamp 4.7.0 download. These infections might corrupt your computer installation or breach your privacy. A keygen or key generator might contain a trojan horse opening a backdoor on your computer. Hackers can use this backdoor to take control of your computer, copy data from your computer or to use your computer to distribute viruses and spam to other people.